A strong collaborative relationship between development and security is critical to achieving real, meaningful reduction in risk in custom applications development. By partnering with the development organization you can identify frequent vulnerabilities and encourage them to adopt practices that will result in more secure code. However, as past experience has shown us, working with development teams can be challenging. 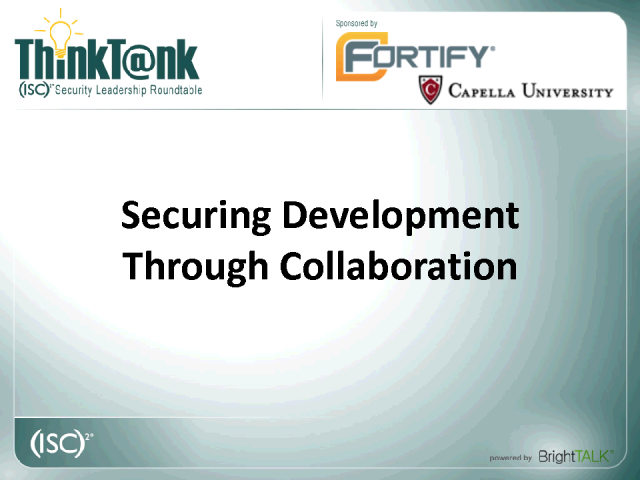 Join us and our sponsors Fortify and Capella University for our next ThinkTank Roundtable webinar on September 14, 2010 at 12:00pm Noon Eastern time where we will discuss some of those challenges and look at how mature organizations have addressed issues like understanding the development mindset, best practices and achieving superior results.